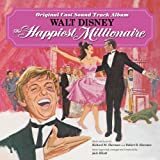 I’ll always be Irish – Paroles de la chanson dans “Le plus heureux des milliardaires”. Interprétée par Lesley Ann Warren, Fred MacMurray et Tommy Steele. On the night before I sailed away, they come from far and near. All me friends and all me kins had shared a parting tear. We knew we never meet again, and yet was clear to see. I’d always be a part of them and them a part of me. ’cause that’s how I began. I’ll say that to any man. And when I’m an American. I’ll be a good one too. I’ll be truly as American as Irish stew. He’ll be truly as American as Irish stew. Ask for Irish stew in Ireland and see what you’ll get. In Ireland, all the stew is Irish. A fact I’ll not deny. And I’ll hold me head up high. I’ll wear the greens on Patty’s Day. And it weren’t all of that. I’ll be truly as American as Casey At The Bat. He’ll be truly as American as Casey At The Bat. If I went to Tibet, I’ve got me a yak. And trapped in Siberia riding his back. The peasant. What would they say ? What if I went to Spain and grew a mustache. Strung the guitar and worn me a sash. Became a toreador and fought me a bull ? After one in both ears and the tail, what would they say ? I’ll shout it good and loud. I’m proud of Irish blarney. And I’ll bet someday we’ll get an Irish president.